Thursday’s successful sale of a 5 billion euro of 10-year bonds appears to have quelled many fears about an impending crisis. The yield offered by the Greeks to bond investor was very high but it didn’t reach catastrophic levels. So what happened? Was all the concern over Greek debt just a temporary panic? An international version of animal spirits gone scaredy-cat? Not by a long-shot. 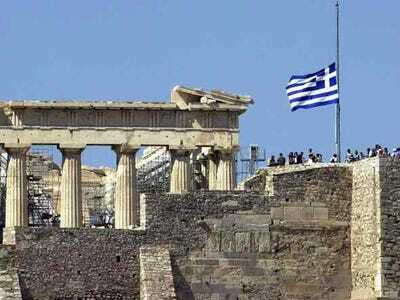 The Greek debt problem still exists and we may well find ourselves fretting about Athens once again. But for now confidence has been restored, thanks largely to three factors. What restored confidence was partly the adoption of an austerity budget by the Greek Parliament, which showed itself able to stand up to the public employee unions and mobs in the streets. The mobs were violent and irrational, but they were smaller than might have been expected. The whole nation did not rise up against austerity, which was a definite possibility. The European Union, France, and Germany all refused to make explicit offers of aide. But there was a kind of winking acknowledgment that they were not going to let Greece fall out of the EU due to debt, if it came to that. And while they expressly refused direct guarantees of Greek debt or grants of rescue funds, there are rumours that they quietly assured their domestic financial institutions they would stand behind them to staunch losses from any Greek default. The great European banks had good reason to want to take comfort from the quiet assurances of political leaders. They have huge exposures to Greek credit, most of which is not covered by credit protection–despite what you might have heard about the derivatives market. Any Greek default would have triggered huge losses. It was safer, for now, to double down and keep the Greek debt ship afloat. Of course, that logic will sound familiar to many who recall the recent crisis on Wall Street. It was precisely this double-down through the “credit crunch” strategy that was adopted by Bear Stearns, Lehman Brothers, and Merrill Lynch. It worked quite well until suddenly it stopped working. Will the it stop working in Europe? It’s hard to say for sure. But the huge debts of Spain loom large. Can the confidence game really get us through a Spanish crisis? There’s really no need to speculate on an answer. Before long we shall see.